How Much CFM Do I Need? Buying an air compressor involves a lot more than walking into a store and picking the first one off the racks. You need to choose the best one according to your needs as they are very unique in size, shape and performance. The most important aspect of an air compressor that shouldn’t be ignored by those seeking ultimate performance is the CFM. But what Is CFM? And how much CFM do I need? Lets answer these common questions without confusing you. Cubic feet per minute is an important measurement of the effectiveness of an air compressor. Usually air compressors have a tank which avails the air to use in different applications and the bigger this tank is the higher CFM rating it has. Most air tools are rated as having average CFM which is typically based on a set 25% duty cycle. Its important to have a good idea of what CFM means because it will allow you to choose the perfect size compressor without buying one too large or small for your needs. This applies to all types of compressors – pancake compressors, 12volt compressors (tire inflators), large compressors and even portable air compressors. While there are several air compressor brands in the market, many come with inflated power and CFM ratings as a way of attracting the most sales. Unfortunately, this misleading information can result in losses for customers seeking high power ratings for their devices. To be on the safe side you should learn the basic formula of calculating CFM by yourself. 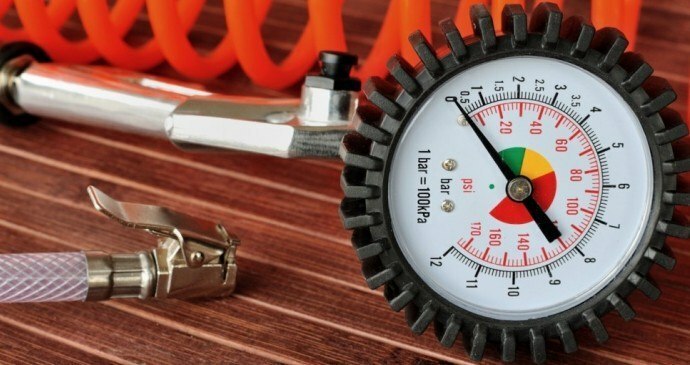 According to the experts, the best way to gauge an air tool’s true power is to measure the time that it takes to pump the reservoir tank whose volume you know from the starting pressure to the ending pressure. Calculate the difference between starting and ending pressure and multiply it with the tank’s volume and divide the result by the time it tool to pump. If you have an air compressor with a 25 gallon tank that starts at 85 psig and ends at 102, the difference is 17 psi. Such a compressor might need 35 seconds to build up needed pressure. First, convert the volume to cubic feet by dividing the volume in gallons by 7.48. 25 gallons divided by 7.48 will give you 3.34 cubic feet. Convert the pressure in PSI to units of atmospheric pressure or atm by dividing your result by 14.7. In this case your result will be 1.16 atm of pressure for that cycle. Finally, multiply 3.34 cubic feet by 1.16 atm to get 3.87 cubic feet per 35 seconds and finally multiply 3.87 by 60/35 to get 6.6 cubic feet per minute. This is a trusted formula to give you an air compressor’s true ability as opposed to relying on what the brand stickers say. However, there is a 30% margin for error but it is certainly more reliable than relying on a marketer’s words alone. For customers who may not know how to calculate CFM ratings, there are standard rated air compressors that they can trust. However, this is not to say that these are the best choice as some unscrupulous manufacturers are known to inflate the ratings as well.